From the publisher of the #1 Amazon bestselling A Timeless Romance Anthology series in Clean Romance. Join three bestselling Regency romance authors, Josi S. Kilpack, Donna Hatch, and Nancy Allen, for three new Regency romance novellas in AUTUMN MASQUERADE. A MERRY DANCE by Josi S. Kilpack. When Lila overhears her uncle talking about a man coming to look for property in the county, she doesn’t think twice, until her uncle says he hopes Lila will find enough interest to marry the man. How can she marry someone named Mortimer Luthford, not to mention that his advanced age of thirty-three, and especially since she’s already in love with her absent cousin Neville? But when Mortimer arrives, Lila has to try every trick known to women to act not interested in the rather fascinating man, which proves a very difficult façade to maintain. UNMASKING THE DUKE by Donna Hatch. The last thing Hannah Palmer wants to do is flirt with men in a crowded ballroom, but when her sister throws a Masquerade Ball, Hannah can’t say no to the invitation and takes comfort behind a mask. She dances with a charming masked man, matching him wit for wit. When the glorious evening culminates in a kiss, and the two remove their masks, Hannah is horrified to discover the man she’s been flirting with all night is her most despised neighbor, the Duke of Suttenberg. No matter how charming the duke was at the ball, and how wonderful the kiss, he is the last man she’d ever accept. WHAT’S IN A NAME by Nancy Campbell Allen. Penelope Timely has a terrible secret. She’s been writing letters to the Duke of Wilmington, pretending to be her ever-proper twin sister, Persephone. Now, the duke has written that he’ll be coming for the Autumn Masquerade Ball and Festival. Penelope will have to continue the charade while the duke is in town in order to protect her sister. The Duke of Wilmington isn’t fooled for a moment, but instead of confessing that he knows about the deception, he finds himself utterly charmed by Penelope and jumps into the game of deception to see how far the twin sisters will take it. The timing of the release of Autumn Masquerade is perfect. Pick this one up for a reading by the fireplace with some mulled cider. 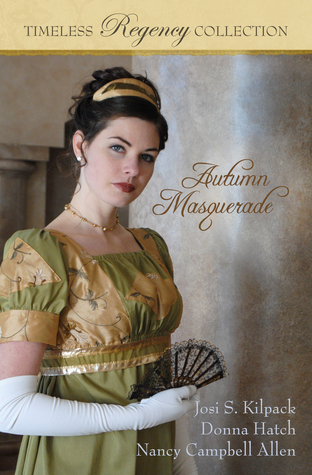 The setting: Regency Era, the season: Fall, the characters: all dressed up for a Masquerade ball. Each of these stories is unique, clean and well written. They are long enough to give the reader a full taste and the plot line has time to fully unfold. I loved that they are short enough to digest in one sitting and that this time there are only three stories in the anthology so you don’t feel rushed. Well-known, experienced authors offer up historical fiction at its finest.